The project involved a collaboration between Smithsonian’s National Museum of American History, the Library of Congress, and Berkeley Lab. The Smithsonian announced the identification of Bell’s voice today. A Smithsonian magazine article on this research was also published online this week. You can listen to the full recording below and learn more about the project here. Berkeley Lab’s Carl Haber and Earl Cornell developed the noninvasive optical sound recovery technology that gave Bell’s recording a second life. Their method is derived from work on instrumentation for particle physics experiments. It acquires high-resolution digital maps of the surface of audio media without touching them. It then applies image analysis methods to recover the data and reduce the noise of scratches and other damage. A few years ago, Haber and Cornell set up this technology at the Library of Congress, where it’s used to digitally restore audio recordings that are too fragile to play. 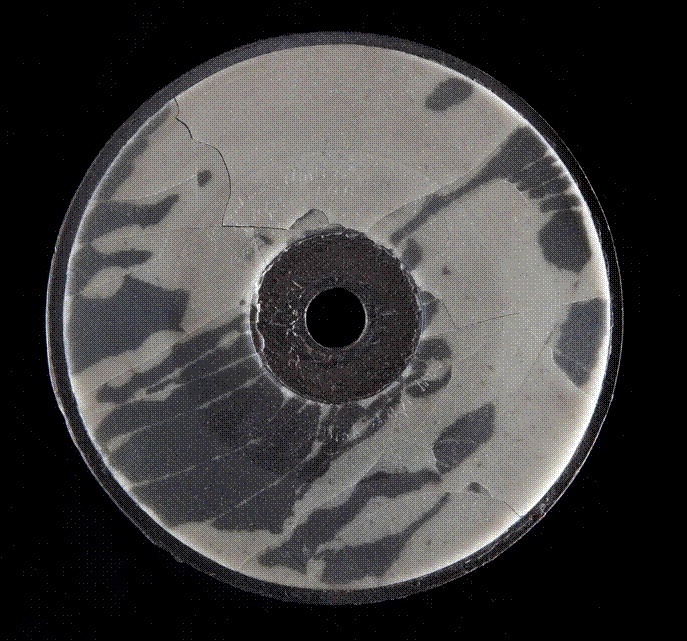 This long-silent disc held a recording of Bell’s voice. The Bell recording, which was etched onto a wax-on-binder-board disc, was made April 15, 1885 in the American inventor’s Washington, D.C., Volta laboratory. It was among a trove of recordings Bell gave to the Smithsonian before his death in 1922. Last summer, at the Library of Congress, Haber and Cornell used their technology to extract Bell’s voice from the long-silent recording. This isn’t the first time Haber and Cornell have made headlines for recovering sound from the distant past. Last summer, they digitally restored an 1878 St. Louis Edison tinfoil, making it the oldest restored playable recording of an American voice. And in 2008, they restored the oldest recording of a recognizable human voice, a “phonautograph” paper recording made in 1860 by French inventor Edouard-Leon Scott. You can listen to the recording here (scroll down to the images of the drum). This analysis was conducted at Berkeley Lab earlier this year. The work required help from Engineering Division staff, who developed the gear and belt seen in the image above. This enabled the drum to be rotated at a slow, steady rate so it can be optically scanned. Learn more about Berkeley Lab’s sound reproduction research here.